With ancient myths and legends to uncover, amazing landscapes to explore and friendly people, Ireland is a great place for a motorhome getaway. If you are seeking natural attractions, then Ireland may be the motorhome destination for you. Ireland enjoys over 1,448km of spectacular coastline, surrounded by the chilly Atlantic on the west and the Irish Sea on the east, and it has something to offer all motorhome travellers. From towering cliffs to clear fresh waters and pristine sandy beaches, and offering an abundance of opportunities for water sports, the coastline enjoys picturesque fishing villages with some of the best seafood you will ever taste. Drive your motorhome to Kinsale in County Cork, Dingle in County Kerry and Kilcar in County Donegal, to name but a few wonderful motorhome destinations. Another of Ireland’s natural wonders is the River Shannon, the longest river in the British Isles and one of the finest Winding through an area of incredible natural beauty that is ideal for camping and motorhoming, this unspoilt waterway flows from the Shannon Pot on the slopes of the Cuilcagh Mountains in County Cavan to Loop Head in County Clare, and on to the Atlantic Ocean. 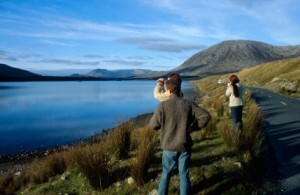 Paradise for nature lovers, the glorious surrounding scenery is the habitat for much of Ireland’s native wildlife. Motorhome hire gives you maximum flexibility on your trip and allows you to get to those faraway retreats in which Ireland specialises. Renting a motorhome in Ireland allows you to get off the beaten track and discover deserted beaches and unforgettable private moments. The Ring of Kerry or the Ring of Beara are incredibly inaccessible without your own wheels and are great places to take your motorhome if you are looking to escape the tourist crowds. For motorhome drivers there is also the stunning Causeway Coastal Route, which weaves through glens and beautiful countryside and offers some of the country’s most dramatic views. The stunning Sally Gap drive in County Wicklow is equally picturesque and is also a perfect route for your motorhome hire, offering breath-taking scenery, and astonishing views as it winds through the Wicklow Mountains. If you want to experience all that Ireland has to offer the rental motorhome traveller, then a trip to the Burren is a must! Formed around 340 million years ago at the bottom of the sea, arresting limestone plateau of the wide craggy Burren is one of Ireland’s most outstanding natural attractions. This extraordinary region stretching from north Clare to south Galway has so much for motorhome travellers to see and do. Caves, lakes, flora and fauna all abound and a chance to see the unforgettable Giant’s Causeway should not be missed. Ireland also offers the more cosmopolitan motorhome hirer a multitude of vibrant and hip cities. The capital, Dublin is famously fun with excellent restaurants, legendary pubs, art galleries, and elegant architecture. Alternatively, drive down to Cork and take in the rich cultural history and fabulous food. Motorhome down to the heritage city of Kilkenny and take in a rich medieval flavour, a world-renowned comedy festival and seriously good pubs. Or, a motorhome hire trip to the ancient Viking city of Waterford with its incredible Light Opera Festival is also well worth considering.